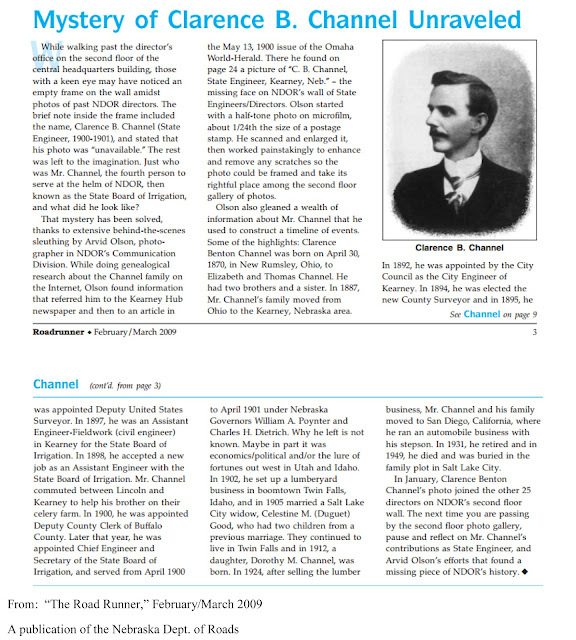 It seemed an unlikely source to find a family history nugget: the newsletter of the Nebraska Road Department. But, here's another example of how casting the net a lot wider via a Google search can pay off. This refers to another descendant of my ancestor Jeremiah Channel(l) of eastern Ohio. It proved to be a good starting point for uncovering more data about this side of the family. The September issue of the National Genealogy Society Quarterly contains an item about what I would call the ultimate helicopter mom (one who hovers), with a macabre twist. "In 1877 a desperate mother writes the State Department to beg for a position for her son. Not unusual on its face, but there is a twist here. She pins to her letter a newspaper clipping about a State Department employee's suicide, indicating she knows this place is no longer filled, and asks that it be given to her son." Source: Applications and Recommendations for Public Office, Hayes-Garfield Administrations. I hope she at least waited for the funeral to be over. On the rare occasions when the death of an early ancestor is noted in the local newspaper, the lack of detail makes the item resemble a telegram, or perhaps TV character Sgt. Joe Friday of Dragnet, known for his dead-pan delivery of "Just the facts, ma'am." 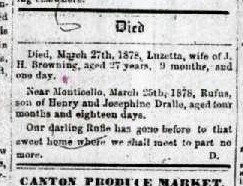 One such example is the death notice of my ancestor, Lucetta (Luhr) Clark Francis Browning, which appeared in the Canton (Lewis Co, Missouri) Press of 12 April 1878: "Died, March 27, 1878, Luzetta, wife of J. H. Browning, aged 27 years, 9 months, and one day." By the time of her death at age 27, Lucetta had lost her father young, been married twice, given birth to at least six children, made the regrettable decision, probably at the direction of her first husband, to sue her mother, and gone through the public humiliation of a messy divorce. I am grateful that I didn't stop researching with the death notice...there was a lot left to the story.